This picture shows a charabanc, a large old fashioned type bus outside the Lovers Leap Inn, on The Dale where Arthur Clarkson was the landlord at the time. They were mostly used by groups for visiting the coast, the races or other places of interest, although on this occasion it looks like a wedding party as one of the gentlemen is wearing a buttonhole. Charabancs were common in Britain during the early part of the 20th century. They were especially popular for sight-seeing or works outings to the coast. The seating was arranged in two rows of crosswise bench seats and in the event of rain a large canvas folding roof would be pulled over from the back, similar to a modern day convertible soft top. 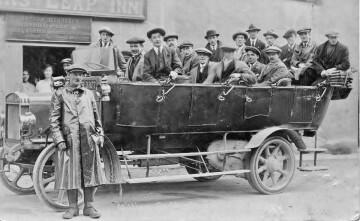 Before World War I, motor charabancs were used mainly for day trips, as they were not comfortable enough for longer journeys, and were largely replaced by motor buses in the 1920s.